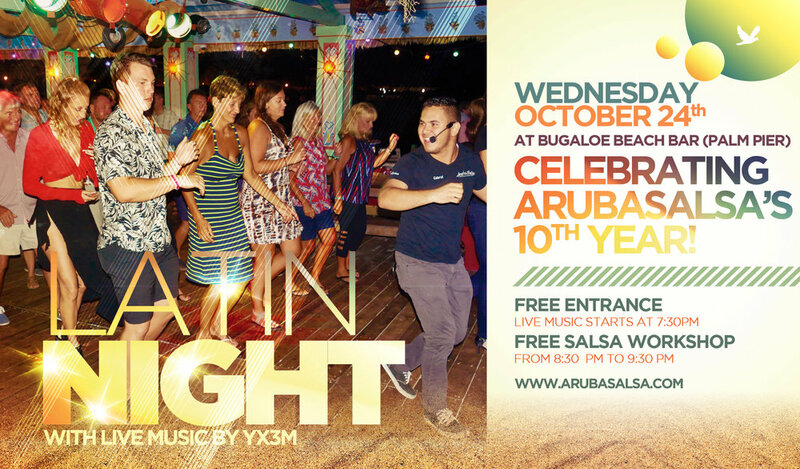 ArubaSalsa's 5 day, 10 year celebration, starts on October 24th at Bugaloe! ArubaSalsa's 5 day event, 10th Year Celebration starts on the 24th of October at Bugaloe! Our funtastic Latin Night starts at 7:30 pm with Live music by YX3M! There's a FREE salsa workshop at 8:30 pm and dancing continues till 11pm! Entrance is FREE, the workshop is FREE. Come and celebrate with us at Bugaloe!!! Newer PostArubaSalsa's 10th year celebration includes loads of FUN! Game night is on! Older PostArubaSalsa's 10th year Dance-A-Thon charity event!